I've always been a fan of art. You see, even though I know how to write an essay or two, I was never one to draw, paint, or come up with awesome concepts that other artists just seem to be born with. This is why I have always been secretly envious of these artists and why I always make it a point to visit museums when I could. You see, I've always wanted to be a painter or simply someone who could draw. Thankfully, Lopez Museum sent this out and of course, I grabbed the chance to visit and have a look around. 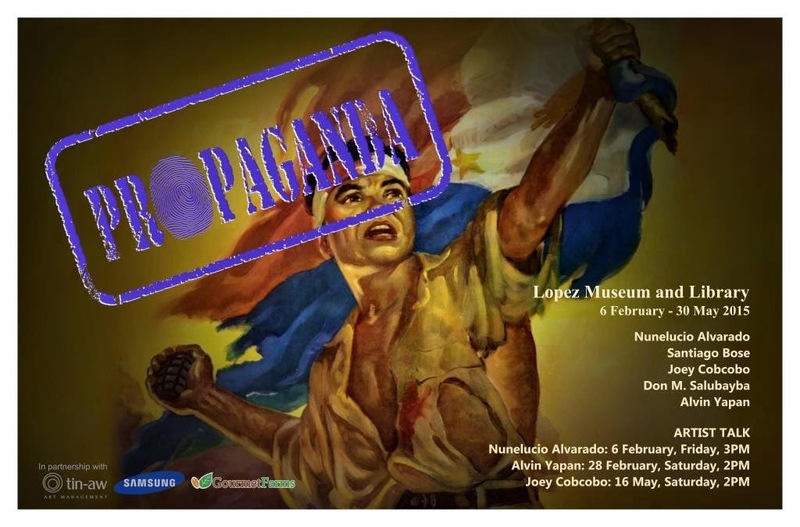 "The Lopez Museum and Library, in a technology partnership with Samsung Electronics Philippines Corp (SEPCO), opens its first exhibition for 2015, entitled Propaganda, on February 6, 2015. The exhibition fleshes out the idea of myth-making and its capacity to inspire change or derail genuine national progress. Featuring Samsung Smart TVs installed with a museum app called “Facets”, the exhibition combines traditional media with digital content resulting in a unique and immersive museum experience. It is an exhibition that challenges not just our notions of art and history, but also how we view museums and libraries. Ricky Francisco, co-curator of Propaganda, said the exhibition was conceived to commemorate the 70th anniversary of the end of World War II with Don M. Salubayba, 2009 CCP Thirteen Artists Awardee and one of the most promising artists of his generation. Salubayba unexpectedly passed away during the planning process and the exhibition evolved to also be a tribute to him. The exhibition includes a few of his important works such as Pagsasabuhay, Abysmal Abound: Trinity of Passiveness, and his “anino-mation” (shadow puppetry animation) A Not so Giant Story (Legend of the Philippines) that have been sourced and borrowed with the help of Tin-aw Art Management. Also featured are World War II posters, election-related archival materials, LVN movies still photographs, a collection of rare maps, Philippine imprints; a recreation of Santiago Bose's 1983 installation Pasyon at Rebolusyon that has been reinstalled by Kawayan de Guia; commissioned works from social realist and Negros Occidental-based artist Nunelucio Alvarado; 2012 Thirteen Artists awardee Joey Cobcobo; and writer and Gawad Urian awardee film-maker Alvin Yapan. Enriching the exhibit and re-framing the exhibition issues are works by 18th century masters Juan Luna and Félix Resurrección Hidalgo, along with those of national artists Fernando Amorsolo, Jose Joya, Cesar Legaspi, Vicente Manansala, and J. Elizalde Navarro from the permanent collection. This is me making a mark on Joey Cobcobo's canvass. Through Samsung Smart TVs and mobile devices, visitors will see ultra-violet scans of Juan Luna’s Espana y Filipinas, revealing details behind the painting; flip through digital copies of the library’s oldest books in its collections that date back to the 15th century; watch a video of the conservation process of these old books; and view several of Felix Resurreccion Hidalgo’s studies of Per Pacem Et Libertatem on a tablet device. Propaganda will run from February 6 to May 30, 2015 and is presented with support from Samsung Philippines, Gourment Frams, Inc., Tin-aw Artists Management, the heirs of Doña Narcissa de Leon (LVN collection), and ABS - CBN Film and Media Archives. For more information, call Tina at 6312417 or email lmmpasig@gmail.com. Lopez Museum and Library is at the G/F Benpres Bldg., Meralco cor. Exchange Rd., Ortigas Center, Pasig City. Museum and library hours are 8-5pm Mondays through Saturdays except Sundays and holidays."